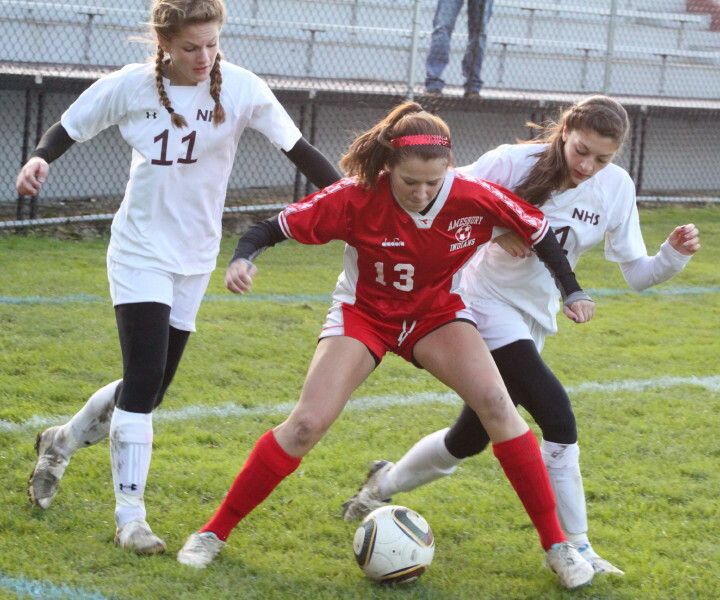 Carly Brand (11) and Maryam Moshrefi (21) gang up on Erin Leary (13). Both Clipper sophomores scored goals. 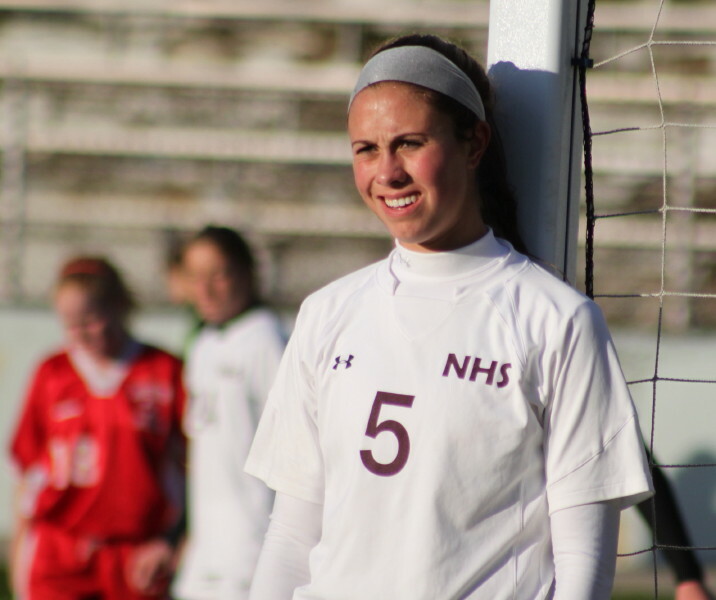 (Newburyport) Newburyport defeated Amesbury, 2-0, in girls soccer on Friday afternoon at chilly World War Stadium. It was Senior Night and seven Clippers were honored before the game started. Newburyport (13-2-2) has excellent seniors but in this one it was the sophomores who came up big. In goal, sophomore Lilly Donovan collected her ninth shutout of the season. 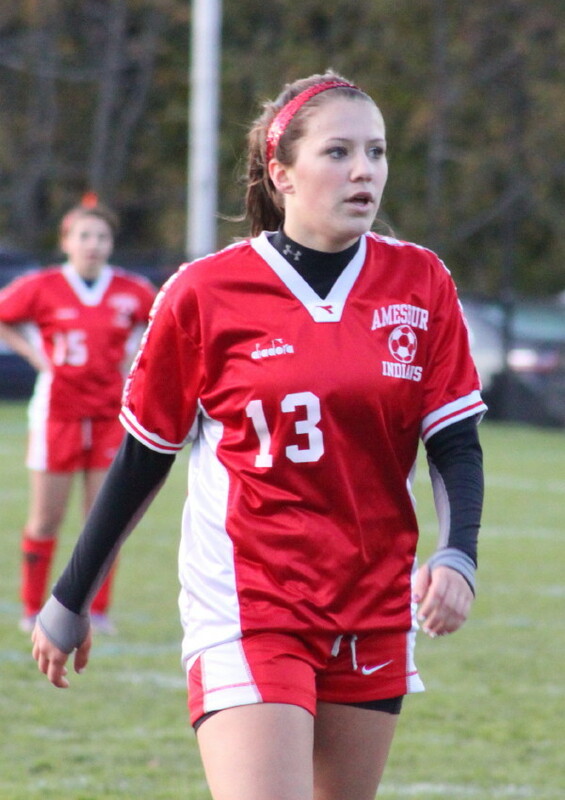 She wasn’t tested nearly as severely as Amesbury goalie Sarah Abraham was but she made the saves when she had to. 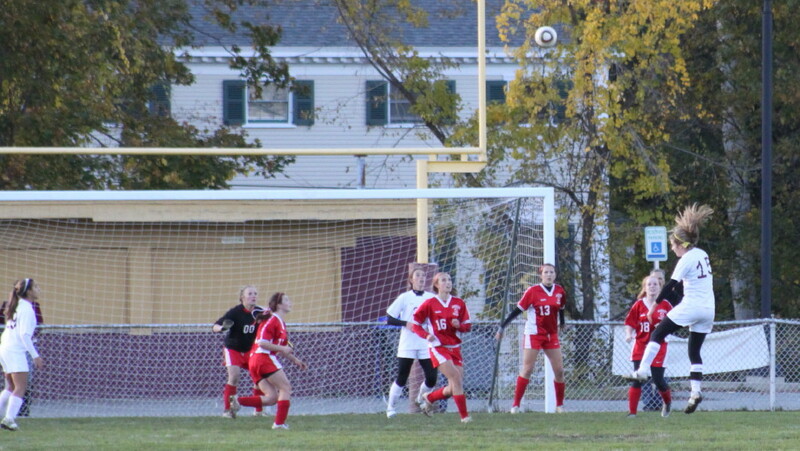 Carly Brand (11) has just redirected a Hannah Martin direct kick past Amesbury goalie Sarah Abraham. 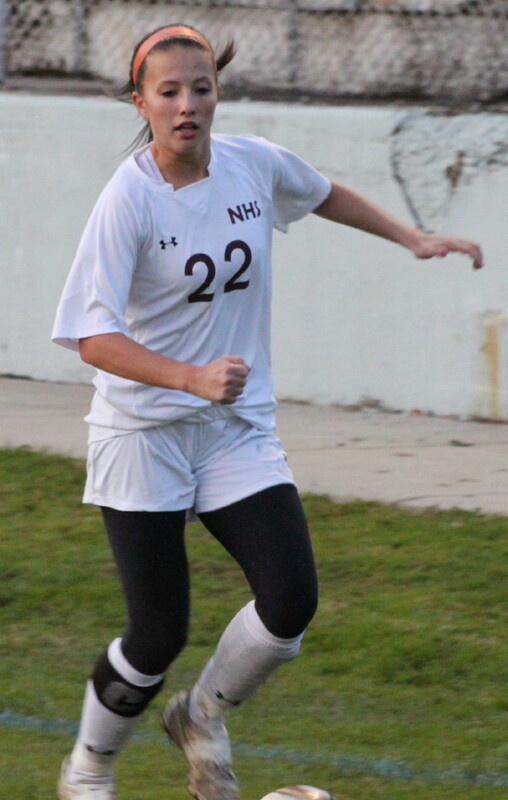 Sophomore Carly Brand scored Newburyport’s first goal (24:55) when from in front she slightly altered the direction of teammate Hannah Martin’s direct kick past Sarah Abraham. Later, Carly broke down the middle and spotted, another sophomore, teammate Maryam Moshrefi, open on the right wing. A quick pass gave Maryam space and time to line up and fire a blast from the right that sailed over the AHS goalie’s head. Both those scores came in the first half. The one that really did in the Indians was the Maryam’s goal (39:10) which went in with less than a minute until halftime. A one-goal game and anything can happen. Two goals and a team has to sustain some offense. On this day, Amesbury (8-5-4) was content to try for the home-run play and just couldn’t get a long pass to connect. Amesbury’s best scoring chances were in the first half. Janine Fatal drilled a shot from the middle over the top of the net and 5 ½ minutes later Hannah Zannini picked up a Lilly Donovan drop but couldn’t finish with a shot on net. 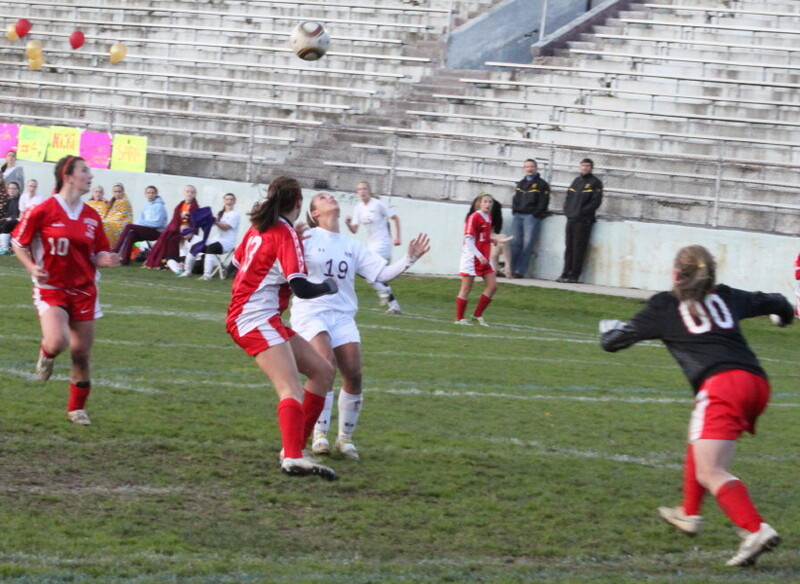 Hannah Martin (15) threatens with header. The Clippers had good chances in both halves. 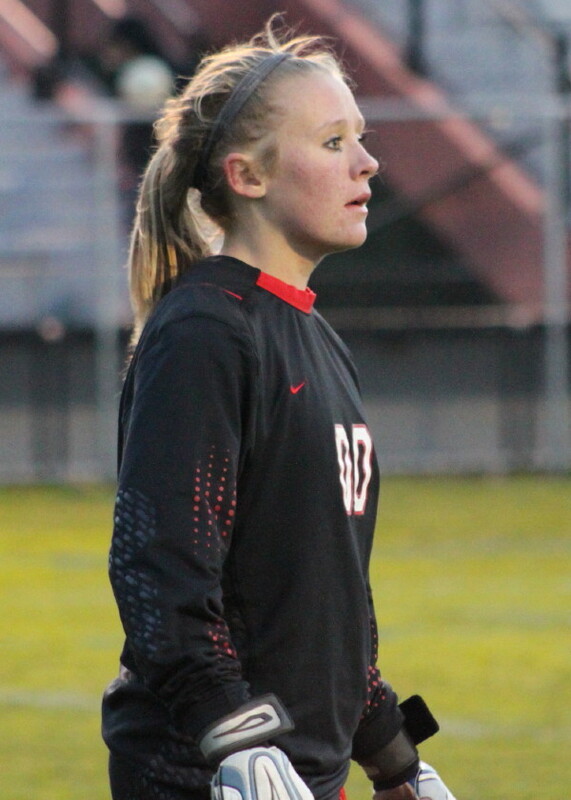 Two of the better ones were Hannah Martin’s header that went just wide in the first half and Jaycie Triandafilou nearly getting off a shot when she was in close in the second half. The Newburyport win avenges a loss to Amesbury (1-0) at Amesbury on September 21st. Since that loss thirteen games ago, Newburyport has been 10-1-2. Amesbury since then has been 6-5-3. Both teams are tourney bound. They will each finish their regular season on Monday (October 31st). Newburyport hosts Ipswich while Amesbury travels to Tewksbury for 3:45PM games. Amesbury had plenty of speed while Newburyport had plenty of size. 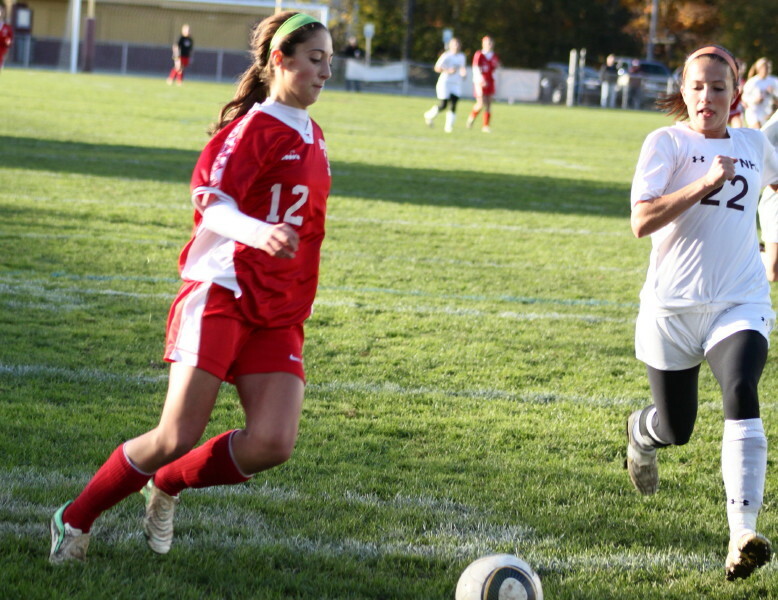 Erin Leary may well have been Amesbury’s best player in this game. The junior turned back numerous Clipper threats. Whitney Whitlow was introduced but wasn’t at the game. She is a captain and a returning CAL All-Star. With Game Seven of the World Series tonight and a significant snowstorm scheduled for tomorrow night there was plenty of additional excitement in the air. (I take my own pictures and collect my own stats. I own the mistakes.) Pictures enlarge to normal size if you click on them. Jaycie Triandafilou looks to head as goalie approaches.